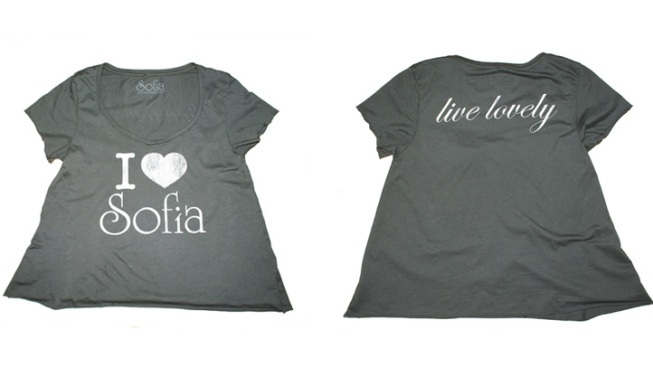 Sofia Vintage hasn't been able to keep this t-shirt on the shelves after Britney Spears was photographed wearing it. A celebrity endorsement can go a long way toward launching a product. But usually you have to pay the celeb for the thumbs up. Unless you're lucky enough to be Sofia Vintage. A couple of photos of pop superstar Britney Spears wearing an "I Heart Sofia" tshirt has meant big business for the Oak Street store. Spears posted a photo on her Facebook page wearing the t-shirt backstage at her Chicago concert a couple of weeks ago, and a Nashville radio station's blog posted a photo of Spears walking down the street sporting the tee. And not surprisingly, her fans started investigating where they could buy the shirt, which is exclusive to the Chicago store. "We were so excited to see Britney wearing our I Heart Sofia tee. I have always been such a Britney fan, and to see her representing Sofia is amazing," store owner and stylist Ashley Zisook says. Zisook says Britney's stylist and personal trainer had heard from multiple people to be sure and stop in Sofia when they were in Chicago. They picked up a several items for Spears including M2F mini shorts in Rose (which she is also wearing in the Nashville picture), a custom hand piece by Coco's Closet by Blair Weiner. The emails and phone calls requesting the tee have come in from all over the country. But if you want to grab one for yourself, you have to act quickly. The shirts have sold out and the store place another order on Wednesday, according to Zisook. Other celebs who've shown Sofia love include Maria Menounous, Nicole Richie, Winona Ryder and Leighton Meester. Britney Spears pictured backstage before her United Center show.